The last Carl Barks book I reviewed was Trail of the Unicorn, with stories that were originally published in 1949-1950. In it, Scrooge still felt like a draft of the character he would eventually become. This latest volume, The Seven Cities of Gold, has stories from five years later, where Scrooge is already fully formed. There are a few things that jumped out at me in this volume, not the least of which is that there are a couple (just a couple, not even a large number) of stories, "The Fabulous Philosopher's Stone" being one of them, where it's just a bit anticlimactic and seem to end quite abruptly. But that may just be in comparison to the Barks stories I'm coming from, which normally wrapped up more elegantly. Another thing that jumped out at me is the lack of 10-pagers. 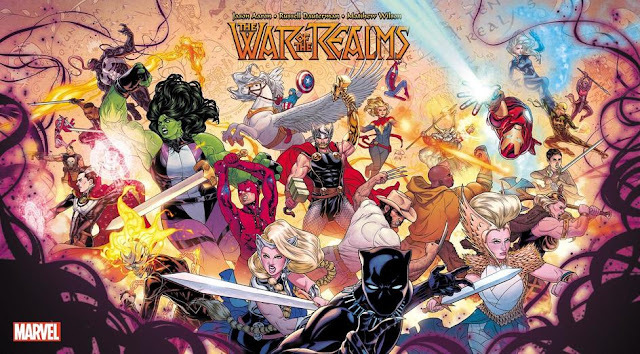 A staple of the previous volumes, there's all of one 10-pager and then a couple of 4-pagers and an 8-pager. I don't know why there's this sudden format shift, but the only real explanation I could think is that all these came from the Uncle Scrooge comic, so maybe the page count was different? I'm not sure. There's also three stories here that showcase Scrooge's luck with money — that is, money seems to find him. I'm not as strict with the portrayal of Scrooge as someone who worked and scrimped for everything he owns, and do find it humorous when it's because of luck (mostly, it's just because Barks is able to execute it well), but I do admit that I prefer the hardworking Scrooge to the one who makes a million dollars without actually doing anything to earn that profit. Supposedly, according to some of the notes in the back matter, this stretch of stories was really hard for Barks, since it was this period where editorial was changing his stories arbitrarily and with little reason. There's a revised scene in "The Golden Fleecing" where the editors asked him to revise a set of panels that not only changed the feel of the antagonists, but also seemed to have no good reason behind it. The stories in The Seven Cities of Gold are still fast-paced, and are still really fun rides, even if they don't wrap up as well as stories from the previous volumes. Barks' use of big panels for big moments, such as when they enter the Labyrinth of Crete or see the Sleepless Dragon, is just as effective as they were in previous volumes, with Barks really turning up the level of detail to emphasize these big moments. There's still a lot to learn here, and certainly a lot to enjoy. 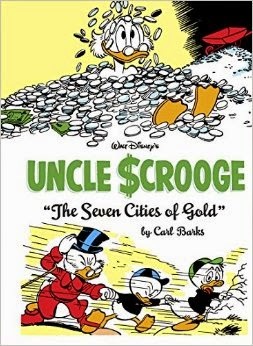 The stories in Uncle Scrooge: The Seven Cities of Gold first appeared in Uncle Scrooge #7-14, from September 1954 to August 1956, and are listed below. The Seven Cities of Cibola. The most famous story in this volume has Uncle Scrooge, Donald Duck, and Huey, Dewey, and Louie looking for arrowheads, as a way for Scrooge to rediscover the excitement of entering a new business venture. This leads them to look for the lost cities of Cibola, but the Beagle Boys follow them. There's a sequence in this in which Barks implicitly trusts the audience, as he relates the story of how some explorers visited Cibola only via the explorers' documents and some pictorial carvings done by the Cibolans. The reader has to put them together, the same way Scrooge and company do. When you consider Barks' audience (kids), that's a good way for a creator to show faith in his readers. This story also has the most tangible example of Barks inspiring George Lucas and Steven Spielberg, as it has the sequence that inspired the opening of Indiana Jones and the Raiders of the Lost Ark. The ending is also fun in that it provides a nice twist from the usual type of ending we're accustomed to, while at the same time being no less satisfying. The Mysterious Stone Ray. Scrooge's frequent swims in his money bin have coated him with gold dust, clogging all his pores and making him incredibly tired and sluggish. He takes his doctor's suggestion to take a vacation, and a message sent in a bottle makes him choose an uncharted island. But when he gets there, he not only finds the Beagle Boys, he also finds a big giant ray gun that turns people into stone! Can they figure out what's going on, prevent themselves from turning to stone, and capture the Beagle Boys? The Lemming With the Locket. A lemming steals a locket from Scrooge. The locket contains all the combinations to Scrooge's safes. The lemming gets on a boat. The boat lands in Norway. There are a lot of lemmings in Norway. Hilarity ensues. The Fabulous Philosopher's Stone. Scrooge goes after the Philosopher's Stone, which turns everything it touches into gold. A small man with a giant beard is also after the stone. Although I criticized this story for having a rushed ending, to do so is to kind of miss the point, as the real meat of the story lies in Crete, when the Ducks find themselves in the Labyrinth of the Minotaur. The Great Steamboat Race. In 1870, Porker Hogg and Pothole McDuck embarked on a boat race, with the winner getting a beautiful Southern mansion. However, the boats sank to the bottom of the Mississippi and the race was never finished. Now Porker's nephew, Horseshoe, challenges Pothole's nephew (guess who?) to finish the race. Scrooge accepts — but with the condition that they have to start the race from where it left off, which means that at the start of the new race, they have to raise the boats and get them running! Can Scrooge and the Ducks pull this off, even as Scrooge all of a sudden has a bad sneezing fit? This is not the first Barks story that involves a boat race, nor the first one to involve a sunken boat. Barks repeated motifs a lot because there was high enough audience turnover that things would remain fresh in readers' minds anyway. Riches, Riches, Everywhere! Scrooge wants to prove to Donald that he can find treasure anywhere, and via a process of random selection, decides to do so in Australia. But two shadowy guys follow them everywhere, hoping to learn the secret of McDuck's prospecting abilities, splitting Donald and Scrooge up from the kids, and leaving Donald and Scrooge with no water. It's a running gag throughout that Scrooge just digs anywhere and finds something, so it may undercut his "I worked really hard for my fortune" personality. But what the hell, it's a funny story. The Golden Fleecing. Scrooge wants a golden fleece so he can make a golden coat. He gets tricked by the mythical larkies (who were disguised as caricatured Arabs, an unfortunate sign of the times) and gets himself and Donald kidnapped and taken to Colchis. There, Scrooge has to judge a cooking contest, with the winning cook becoming queen of the larkies. Huey, Dewey, and Louie show up, but they not only have to get the golden fleece and evade the larkies; they also, somehow, have to get past the sleepless dragon! A really enjoyable yarn. The Tuckered Tiger. Scrooge offers his weight in diamonds to the owner of the animal that wins a race. Of course, this is because he owns Lubricated Lightning, the fastest horse and animal in Duckburg. At the last minute, the Maharajah of Swingingdore shows up and enters Sabertooth Third, the fastest tiger to come out of Asia. The Maharajah also offers his weight in diamonds. As the race gets closer, both animals show worrisome signs so both Scrooge and the Maharajah start getting worried. This leads to them trying to lose as much weight as possible before the race even starts. The Million-Dollar Pigeon. Scrooge wants to save money on postal fees, so he has a carrier pigeon, to whom he entrusts a million dollars to deliver to the bank. Unfortunately, it's time to fly south for the winter, so Scrooge's million never makes it to the bank. A Campaign of Note. Scrooge refuses to engage in crowd-pleasing maneuvers to be elected Treasurer of Duckburg, so Donald and the boys try to help him out. Heirloom Watch. Scrooge has broken a watch that has been in the McDuck family for generations, a watch so accurate that it can even tell the exact minute of the next solar eclipse. However, he stands to inherit his Uncle Quagmire's estate, but for it he needs the watch! I don't think this was up to the level of what's come out so far, but it's still so fast, so full of momentum, and so well-crafted. I'll still highly recommend it. Excellent review! Looking forward to reading my volume, as soon as I'm through with "Only a Poor Old Man".